Somewhere in between the manic, annoying comedic Robin Williams and the more recent, somber, serious, and even creepy Robin Williams is a normal human being. With R.V., Williams (Robots, Noel) goes the way of Steve Martin and Tim Allen by making a bland family movie about an overworked father who slowly rediscovers the meaning of family. If R.V. had a bunch more kids, the film would star Martin. If it took place during Christmas, it would star Allen. Heck, since this is a road trip, it may as well star Chevy Chase. R.V. has the same "been there, done that" feeling present in all bland family movies. Robins is Bob Munro, and overworked father who frets that his family lives together, but spends all their time separately. Bob is worried about his job, where a younger, cheaper, Ivy League graduate may replace him. His wife Jamie (Cheryl Hines, Herbie: Fully Loaded, Along Came Polly) is a harried (but not desperate) housewife. 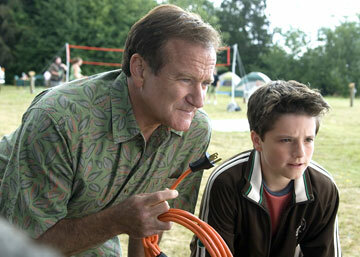 His son Carl (Josh Hutcherson, Zathura, Little Manhattan) works out like crazy because he is short for his age. His daughter Cassie (Joanna "JoJo" Levesque, Aquamarine) was once his little princess. But along comes puberty, and now she wants nothing to do with him. The Munros were originally going to a dream vacation to Hawaii. Bob receives a last minute assignment that forces him to cancel his vacation, lest he lose his job. Now, he needs to work on a proposal to buy a small soda company in Colorado. Bob comes up with a scheme were he rents an R.V. for a road trip. This gives his family time to spend together, and gives him a chance to secretly work on his proposal so he can keep his job. His family hates this idea, and the trip, in a garishly huge rental, starts horribly. Everything else is strictly formula. Director Barry Sonnenfeld (Men in Black II, Big Trouble) and screenwriter Geoff Rodkey (The Shaggy Dog, Daddy Day Care) do not have one original thought to put into their story. There are some weird RV enthusiasts (Jeff Daniels, Good Night, and Good Luck, The Squid and the Whale, and Kristin Chenowith, The Pink Panther, Bewitched) that follow the Munros around, and an unfortunate encounter (mostly for the viewer) with a faulty septic tank. Through it all, Bob lies to his family and tries to get work done. Eventually, he'll tell them the truth, and eventually, the family will realize the importance of good family bonds, but it doesn't come fast enough for the viewer. 1 hour, 38 minutes, Rated PG for crude humor, innuendo, and language.